When the findings of the characterization studies of plasmid replication intermediates are combined with the properties of the pFOXC-RT revealed from in vitro reverse transcription assays, a model for linear clothespin retroplasmid replication can be developed (Fig. 4). Replication begins with transcription of the plasmid DNA, most likely by a host mitochondrial RNA polymerase. 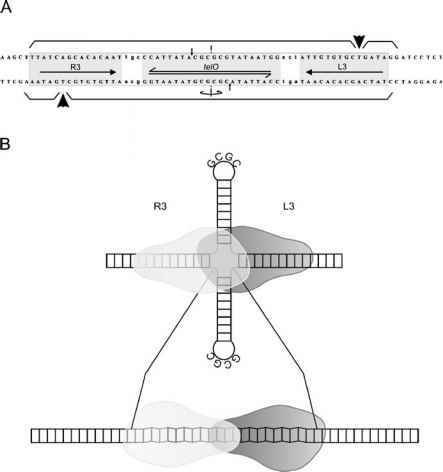 The length of the RNA transcripts suggests transcription likely begins on the top strand and proceeds around the hairpin to the terminal repeat region (Walther and Kennell 1999; Simpson et al. 2004). The full-length transcript potentially serves as both an mRNA for the reverse transcriptase and as a template for (-) strand cDNA synthesis. Following translation, the pFOXC-RT may bind directly to the RNA in cis and initiate cDNA synthesis at or near the extreme 3' end. Although the nature of the primer has yet to be determined, in vitro studies indicate that the pFOXC-RT can use DNA or snapped-back RNA primers. Due to the phylogenetic relationship with the pMaur-RT, the pFOXC-RT may also be able to initiate cDNA synthesis de novo. In addition, since the mature plasmid contains a 5'-linked protein, it is also conceivable that a protein is used as a primer. In this scenario, the RT may function as a primer itself, as has been shown for hepadnaviruses, such as the hepatitis B virus (reviewed in Ganem and Schneider 2001). Figure 5a shows four potential initiation mechanisms. Fig. 4 Hypothetical replication cycle of linear clothespin retroplasmids. 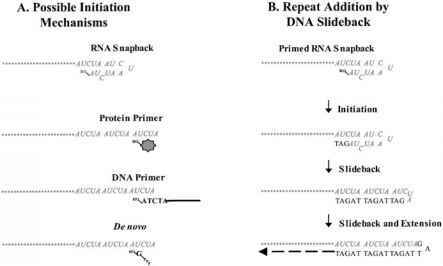 Replication begins with transcription of the plasmid DNA by the host mt RNA polymerase. 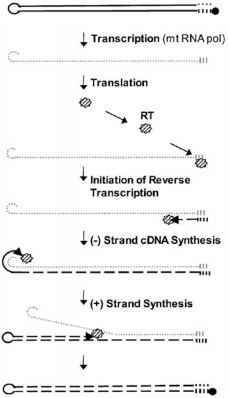 Transcription begins on the top strand and proceeds around the hairpin to the 3' repeat region (vertical bars). Transcripts (dotted line) appear to contain fewer 3' repeats than are associated with plasmid DNAs (three repeats vs. four repeats). The transcript serves as both an mRNA and a template for (-) strand cDNA synthesis. Following translation, the RT (diagonally-striped star) associates with the 3' end of the plasmid transcript where it initiates cDNA synthesis and may generate additional copies of the 5 bp repeat. Potential mechanisms used for initiation and repeat addition are shown in Fig. 5. Reverse transcription continues until the RT reaches the 5' end of the RNA template, generating a full-length (-) strand cDNA (dashed line). The 3' end of the (-) strand cDNA may serve as a primer for (+) strand synthesis, which is catalyzed by the plasmid RT or host DNA polymerase. The RNA template is degraded by a host RNAse H or displaced during the synthesis of the (+) strand. Following second strand synthesis, the RT (or mt DNA polymerase) may associate with the 5' end to potentially function as a protective cap than once and would generate (-) strand cDNAs that have a greater number of repeats than associated with the RNA template. strand synthesis. Due to the ability of the pFOXC-RT to copy DNA templates, the second strand may be synthesized by the pFOXC-RT; however, it is also possible that a host DNA polymerase is utilized. Once DNA synthesis is complete, the RT may dissociate from the plasmid DNA, or it may associate with the 5' end to potentially function as a protective cap.